Secton 3 It shall be the duty of the secretary to enrole the names of all the members to keep a record of all the procedings of the Union to notify the public of the Meetings and to sine all orders on the Tresurer for bills allowd by the Union and to fill out and return the annul meeting or a least to the exetive Committee of the Union. Section 4 It shall be the duty of the the Treasuer to collect and hold all membership fees reporting promptly the names of those having the [sane?] to the secretary for enrolment, She shall also hold all monies collected for the Union, paying all bills on order of the Secretary countersinned by the President. 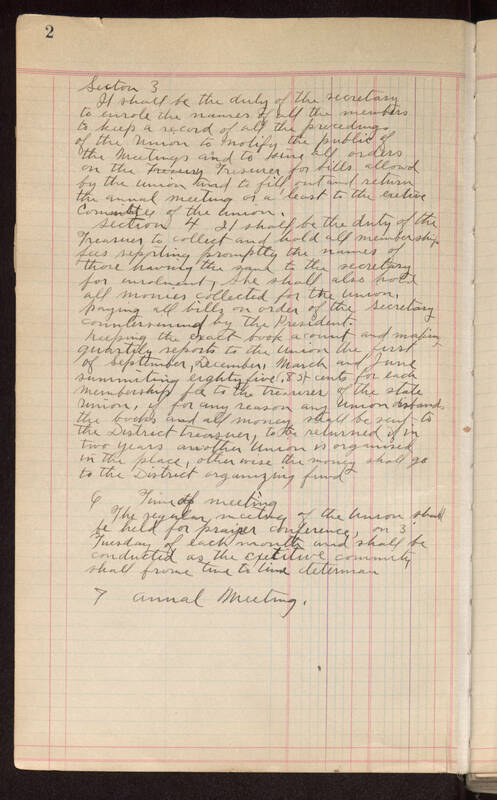 Keeping the exact book acount and making quartily reports to the Union the first of September, December, March and June summiting eight five (.85) cents for each membership fee to the Treaserer of the state Union, if for any reason any Union disband, the books and all money shall be sent to the District Treasuer, to be returned if in two years another Union is organized in the place, other wise the money shall go to the District organizing fund 6 Time of meeting The regular meeting of the Union shall be held for prayer conference, on 3 Tuesday of each month and shall be conducted as the Exetitive commity shall frome time to time determan 7 Annal Meeting.